"There's a lot of us!" Pretty Precious Cargo: to get to know Shirlette on a road trip somehow seemed like meeting her in her natural habitat. Drifting, zoning at the wheel, her shades reflecting the sunlight, her mind apparently reflecting on the ways things go, her words designed to sketch a map of what she perceives and to draw imageries of possible journeys. The horizon shifts with every mile, while she herself – as her poetry does – keeps being centered in her visions, her ancestry and the very moment in the now. Laid back, smart, and very funny with all the word play she constantly drops: the now is where she talks. While “travelling” through various projects over the years, with various bands and musicians, performing traditions from Country to Rap, apparently unwilling, somehow unable to decide on a certain “artistic profile”, consistency is found in her unique, elaborated art of rhyming, of writing lyrics. Shirlette above all is a poet. “Twilight 4 Gladys Bentley” is her first all HipHop studio album. Text- and soundwise the album is overtly sexual. 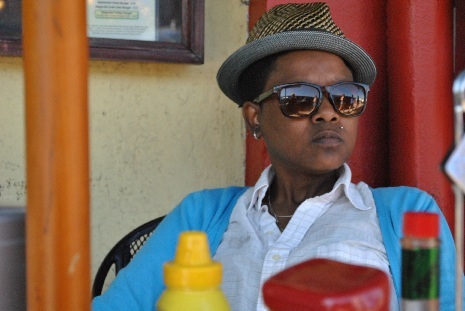 Here, Shirlette fuses queer history with the power of spitting lyrics on a beat. Gladys Bentley was a Black artist from New York who in the 1930s was known for her performances, i.e. lesbian parodies of blues. Twilight 4 Gladys Bentley is a homage, a historic reference to strong female queer art traditions, to those who opened the pathways… In Hip Hop and Rap, self-affirmation almost traditionally is achieved by presenting oneself as sexually powerful. To be recognized as a rap artist, sexual power seems to be a core feature. By openly inscribing queer lesbian history in her music, Shirlette acculturates and transforms those potencies of HipHop to empower queer sexuality. Seriously beautiful.